If you're looking for a fixed rate to save for your short or long term goals, we offer a variety of CD and IRA options. Visit a local banking center to get started or contact our Customer Assistance Center at 800-860-8821. ^APY = Annual Percentage Yield. Interest and APY is subject to change at any time. *You must maintain the minimum balance of each tier in the account each day in order to receive the APY disclosed for that tier. Find the savings solution that fits you. 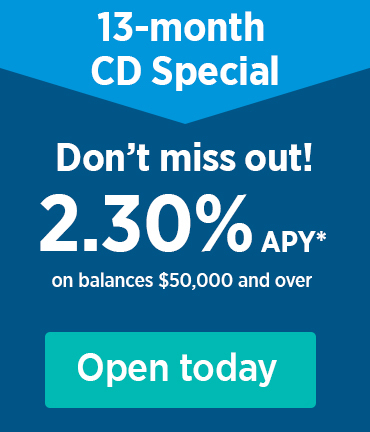 *Annual Percentage Yield (APY) of 2.30% for 13 months is accurate as of 4/9/19 and is subject to change at any time. This is a tiered CD for consumer customers only. The minimum opening balance to obtain the 2.30% APY is $50,000.00. For balances between $10,000 and $49,999.99, the APY is 1.50% for 13 months. Penalty may be imposed for early withdrawal. You must have a Camden National Bank checking account at the time this CD is opened. This offer is available for a limited time only.